Are you searching for where to buy your next mattress in the adventurous state of Colorado? After a long hike through the Rockies your bed will be calling you, but even after a long day — without a quality mattress — catching some ZZZs isn’t always easy. We recognize that when it’s time to purchase a new mattress that the pressure can be on. A mattress is not a cheap purchase, and yet it is so important. You will spend more time on your mattress than anywhere else, and a supportive and ergonomic mattress is essential in today’s world. We also know that it is essential to find something affordable. Overspending is not a practice we recommend for any product which is why we found mattress stores to match every budget. First we took a look through the top-ranked mattress shops in each region and then selected the locations with the highest quality customer service, greatest products, and convenient delivery options. What we discovered is that today, there are great options everywhere. As the mattress market has greatly expanded, you can expect to find quality mattress shops in places like Denver, Fort Collins, Colorado Springs, and Aurora. Even somewhat smaller cities like Boulder , Grand Junction, Pueblo,Aspen and Glenwood Springs will likely have a selection of mattress shops. 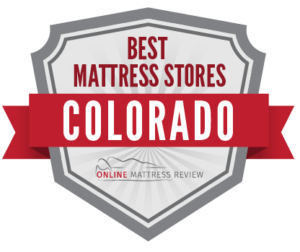 Below we’ve listed what we consider the best mattress stores in Colorado. If you live in Denver, you may be wondering: Where can I find the best mattress stores in Denver? Well, you can rest easy because we have got you covered. We examined some of the top-ranked mattress shops in the Denver metropolitan area and found a number of great options. Whether you need organic, something budget-friendly or an adjustable bed, there are great options for everyone. Urban Mattress Denver (745 S Colorado Blvd.) is located in Southeast Denver in the Glendale neighborhood. Here you will find a wide selection of mattresses for every budget. The sales team are friendly, relaxed and very knowledgeable about their products. Whether you’re looking for latex, foam or eco-friendly, Urban Mattress has it all. There’s even a location in Boulder. Just around the corner from the Denver location is SleepNation Denver (1390 S. Colorado Blvd.) where you will find a friendly store manager who truly understands mattresses. All SleepNation mattresses are made in Denver and come in the full range of sizes and materials. Does your sleep buddy prefer to sleep on something a bit firmer for your taste, no problem. SleepNation has a mattress that will work for all sleeping preferences, and their products are affordable. The Natural Sleep Store is a great place to head if you are looking to purchase a non-toxic eco-friendly mattress. The sales representatives are knowledgeable and patient. Also, you may be surprised by the reasonable price. Their all natural cotton mattresses are affordable and last for years. If you’re walking down Pearl Street in Boulder, stop in Boulder Furniture and Mattress (2125 Pearl St.) where you’ll find this family-owned mattress shop. There are many reasons to shop here: you’re supporting a local business, you’ll find a quality product that will give you years of deep sleep, and you will have an opportunity to speak with an extremely knowledgeable sales clerk. People come from all over the country to try Boulder Furniture and Mattress. Do you need a mattress near Denver? If you’re in Aurora, head to Sleep Solutions (1160 S. Abilene St.) where they are known for problem solving! It’s all in the name, but if you suffer from chronic back pain, sleep apnea, restless leg syndrome or are simply looking to find a premium and affordable mattress, there’s something for all at Sleep Solutions. Have you ever wondered where to find a mattress in Colorado Springs? We found some great options. Mattress Firm covers the most ground with locations in North Academy (7130 Academy Blvd N.) Ridgeview Market (5890 Stetson Hills Blvd. ), Cheyenne Mountain (1670 E. Cheyenne Mountain Blvd. ), and Chapel Hills West (7784 Academy Blvd.). Mattress Firms offers a wide selection of quality mattresses to match your sleeping patterns and your budget. You always have 90 days to test your mattress with a money back guarantee. Mattress Firm offers convenient and fast delivery options as well. Relax the Back (1234 E Woodmen Rd.) is where to head if you are struggling with chronic pain and inflammation. Understanding ergonomics is key when selecting a mattress. Orthopedic doctors, chiropractors, and massage therapists often refer their patient and clients here. This is the only back care store in Southern Colorado. Expect to pay premium prices for this premium product. Head to Platte Furniture (2331 E. Platte Pl.) if you love to take your time shopping and are looking to find a great bargain. You may even find something else for your bedroom and home. The customer service is excellent and the sales team works hard to ensure that you have a product you’ll love. Here’s a tip: if you “like” them on Facebook you may spot something just as it comes through and can purchase it directly over the phone. Platte Furniture offers mattresses as well as box springs and bedding. If you need to find a mattress in Fort Collins, you can sleep easy. Fort Collins has a number of quality mattress stores and mom-and-pop mattress shops alike. Whether you like fast and convenient or slow and low key, there’s a shopping experience and a mattress to meet your needs. We think most people will find something at The Sleep Store of Fort Collins (3500 S. College Ave.) where you will find quality name brand mattresses and affordable clearance mattresses as well. This is a locally operated business with a knowledgeable staff and no-pressure sales. If you are a “Goldilocks” shopper, you can really go for it here- try each bed until you find something that’s just right. Or, if you’re in a hurry, the staff will help guide you through the process efficiently and affordably. The owner has sold mattresses for over 40 years. Urban Mattress (2721 S. College Ave.) sells a number of quality mattresses at great prices. This is the place to head for no-pressure sales, easy delivery, and fast setup. There are over 70 mattress varieties to choose from and, all mattresses are designed and built directly in Colorado. You can even order custom built mattresses. Mattress Firm Fort Pavilion (4312 S. College Ave.) is a great place to head if you are looking for fast and convenient service. You can take your time trying mattresses, as well. Mattress Firm offers same day or next day delivery and 120 days to test your mattress. The sales team are knowledgeable and work to find you a mattress that fits your budget. Are you wondering: “where can I find a mattress in Grand Junction?” We have some answers for you. No need to head to points East just to purchase a mattress. In Grand Junction you can find quality mattresses and affordable prices to boot. Denver Mattress of Grand Junction (957 North Ave.) provides quality customer service- the sales team understand the products, are friendly and will not pressure you to purchase. You should expect a 200% “Guaranteed Lowest Price Pledge” with your product, so we recommend doing some research ahead of your purchase to ensure that you are finding the best deal. As a member of the Furniture Row group, this is part of Denver Mattresses policy. America’s Mattress Outlet (2531 Rimrock Ave) works hard to provide quality customer service. You can find same day or next day delivery as well as affordable prices. Here’s a tip: head in during a major holiday for a steep discount. If you need more than a mattress, try Sears Outlet (2380 North Ave.) where you will find quality mattresses and other home goods for great deals. The store is clean, organized, and very low-key. You can take your time trying mattresses and the sales team are friendly and knowledgeable. While we cover a number of the most prominent mattress stores in metropolitan Colorado, there are of course mattress stores throughout the state. Cities and towns including Pueblo, Grand Junction, Littleton, Greeley, Loveland, Lakewood, Longmont, Durango, Golden, Westminster, Arvada, Broomfield, and others all have mattress stores in the surrounding areas.